Here's a good local restaurant to try if you are exploring off Phuket. 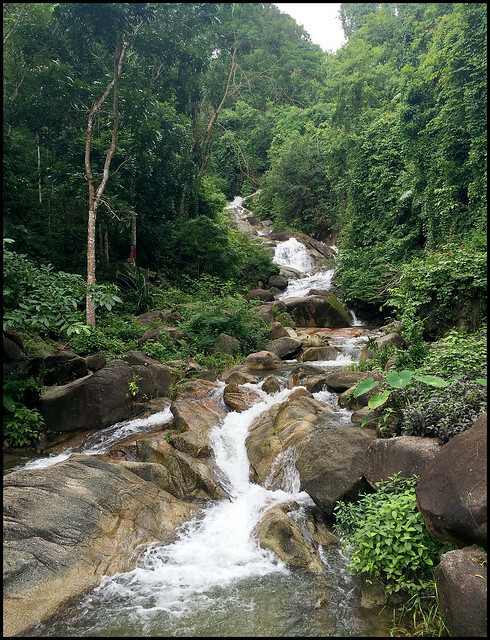 We first found Wat Khao Waterfall towards the end of 2016. 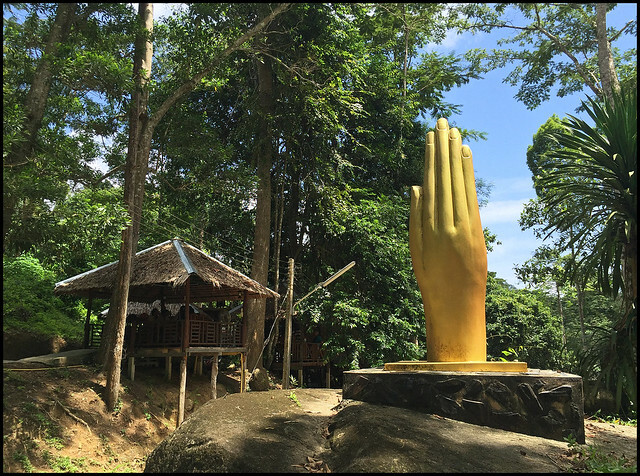 Located just outside the small town of Khok Kloi which is just 10km north of the bridges connecting Phuket to Phang Nga province. The waterfall is not big, but after some rain it's rather pretty and has pools where people can splash about. 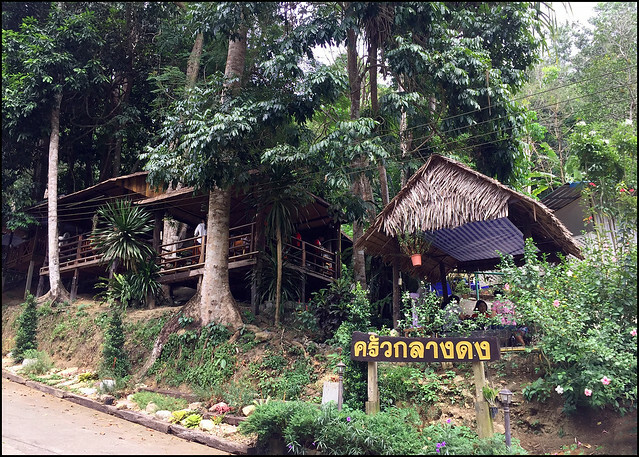 The restaurant called Krua Klang Dong (ครัวกลางดง) is just before the waterfall. Plenty of parking, but not too many tables! We have been 4 times now and 2 times we had to wait for a table to become available. It's popular at weekends especially. 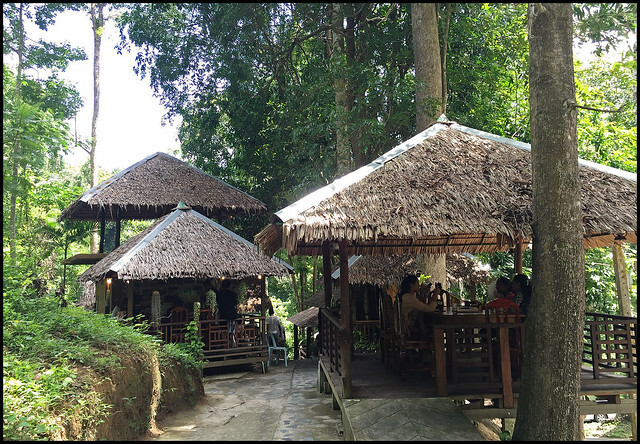 Nearby, before reaching the waterfall is another restaurant, slightly fancier, called Nern Khao View Talay, which we have also been to several times. Either of these restaurants are good for lunch, maybe as a lunch stop before taking a Phang Nga Bay tour. Just walk up a few steps and you can walk along a pathway between the tables, each of which has it's own little grass-roofed sala, so you're not all squashed together. They could easily fill more tables at the weekend, squeeze more people in, but I like the way it's arranged. We've not been mid-week - I think it would be way quieter. 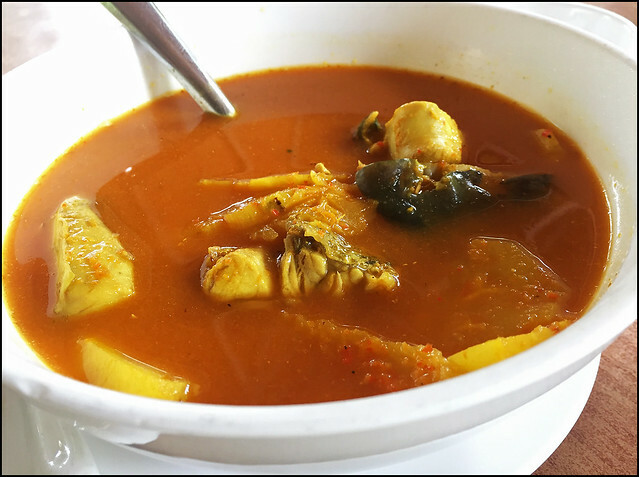 (above) Gaeng Som Pla - a popular southern Thai curry, spicy and sour. My wife's favourite thing to eat! 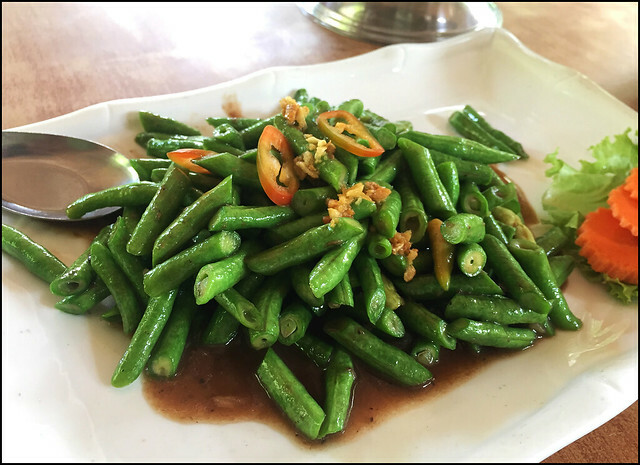 (above) Long beans fried with shrimp paste. Good side dish. Shrimp paste (Kapi) is used a lot in local dishes around Phuket and Phang Nga. 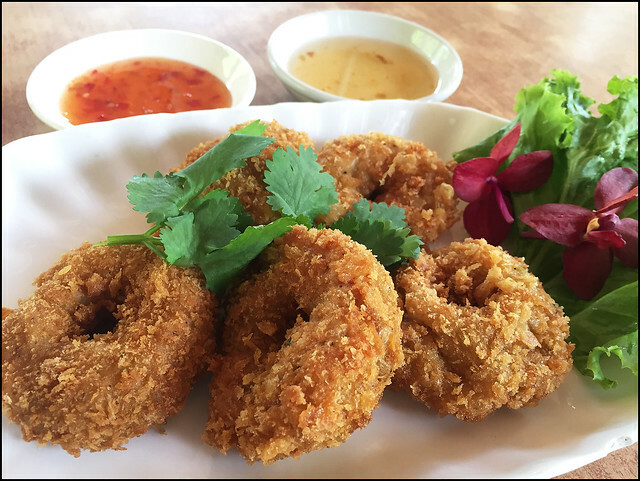 (above) Well, everyone can enjoy these - Tod Mun Gung (ทอดมันกุ้ง ) - Fried shrimp cakes with a sweet dipping sauce. 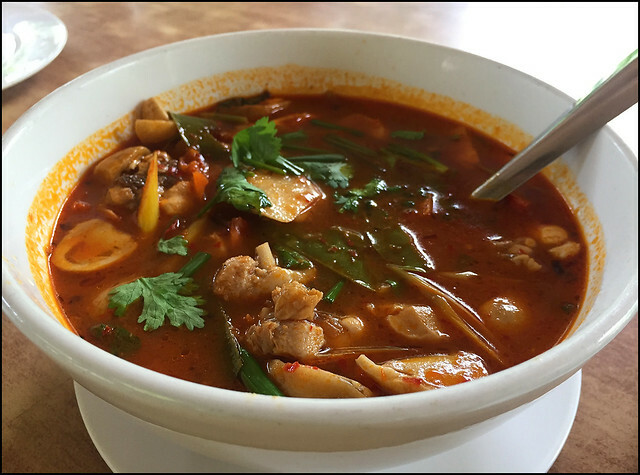 (above) And they do a very tasty Tom Yum .. spicy too. If you want less spicy say "MY PET" (ไม่เผ็ด). 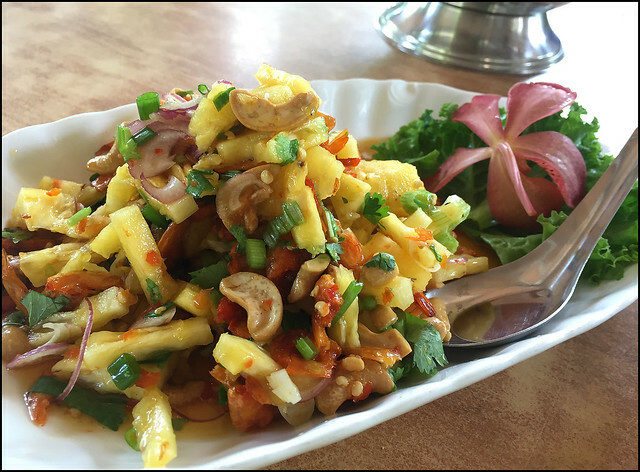 (above) One of my favourite things to eat ... Yam Gung Siap - a real local dish that I have only seen in Phuket and Phang Nga, a salad with dried shrimp, cashews, onion, cilantro and here they do it with extra pineapple. Very very tasty. I want some now. The waterfall (Wat Khao waterfall) is not huge, quite dry in dry season, but sometimes looks like below. A nice place to stop for lunch for sure.